Stunning and beautiful this Bottle Green Suit made from Georgette fabric. It comes with contrast Silk attractive dupatta. Dark Grey Resham Work Pal..
Side Slit Churidar Suit i..
Cotton Salwar Suit with C.. 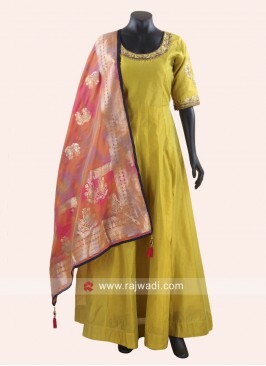 Silk Front Slit Lehenga S..
Straight Fit Salwar Suit .. Satin Silk Floor Length A..